My first Z was a 1976 240 that I bought in San Diego in 1998. It had a number of problems that I was slow to realize but being such an eminently fixable car we just kept going till a ditch got in the way. I salvaged the wooden steering wheel and stick shift nob. 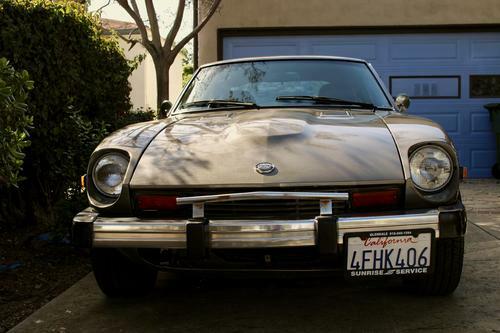 Then I found a 1978 280Z in very good shape and have been keeping it that way ever since. I had the wooden steering wheel intstalled, the seats reupholstered and new wheels put on. It is a joy to drive. Arranging for smog certification. Asking $8,000. Smog Certification coming up. Should be done by April 15. Holding price at $8,000, for this site as I am looking for a buyer who will treat her right... Will post when smog cert done. 1978 280z Odometer reads 45K and that’s probably just what it is. Bought in 1999 from original owner with under 20K miles on it. I barely drive it nowadays and it just isn’t fair to the car. Well maintained, never failed a smog test. Renovations include but not limited to: new paint (BMW taupe metal-fleck), new upholstery (in original burnt orange), new wheels and dash cap. Wooden steering wheel and stick shift nob from my old 240z. This car is a joy to drive. When I’m on the road people wave, high-five and yell compliments at stop lights— it makes my day! Best conversation starter, ever, but you probably know all about that... Will have a price once tune up and general check up done. - Engine runs well and have only done the necessary or advised— as you can see. - Apron missing (under front bumper). - Rust spots under hatch - Tool kit is all there, never been used. Regulation issue Datsun spare tire inflator canister! And original spare tire which has transferred rust stains to well. Next up: service and repair record, or as much as I can lay my hands on. Let me know if need further photos. Thank you for interest and advice!